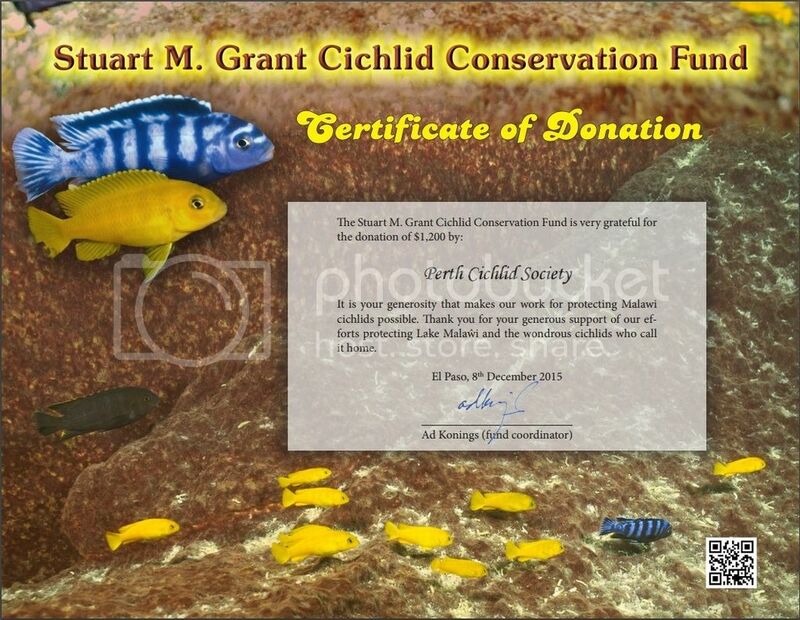 Stuart M. Grant - Cichlid Preservation Fund. 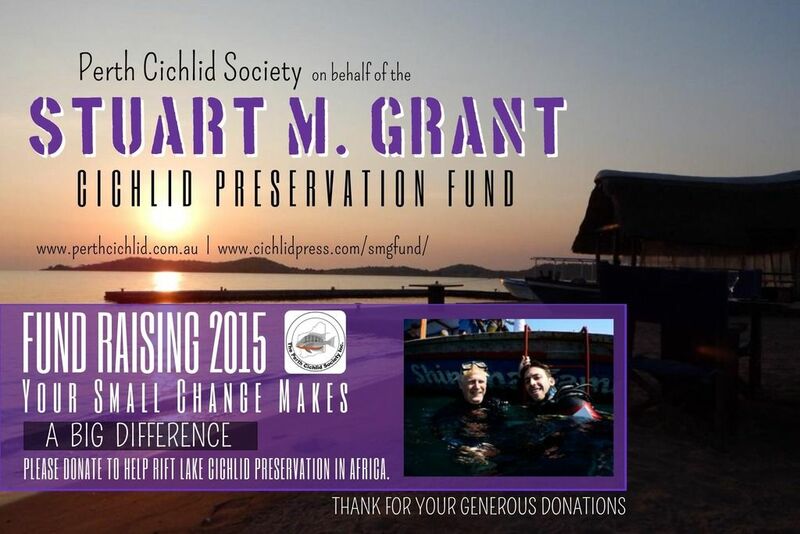 The Perth Cichlid Society will be involved in fundraising and creating awareness for Cichlid Preservation. This is in conjunction with the Stuart M. Grant - cichlid preservation fund. The venture is headed up by Mattia Matarrese and was brought about by his expedition to Lake Tanganyika with Ad Konings. Mattia met first hand the people involved in the Lakeshore Lodge in Tanzania who are trying desperately to save endangered species in the great rift lake. Mattia will expalin this further in his talk at the PCS meeting on Tuesday, September 1st 2015. 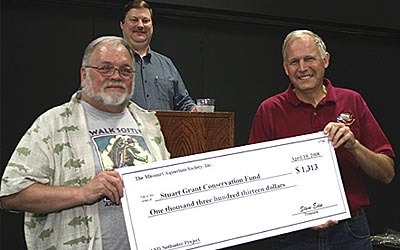 The Stuart M. Grant fund raises awareness of the issues hitting the great rift lakes in Africa and gathers funds to attempt to restore damage caused to Lake Malawi and Lake Tanganyika stocks. The awareness of the situation in Africa and the efforts of this group are not well known or supported in Australia, something the PCS wish to change. We will be raising funds to reach target goals to help build fish farms at the lakes and get the stocks of these endangered species back to a sustainable level. Items you may take for granted are scarce and hard to come by in Africa. Even simple rubber airline can make a difference to these people fighting hard to stem the tide of endangered species from over fishing and hobby targeting. We will be donating 20% of all PCS Kitchen takings and 20% of all PCS Raffle takings until our goals are met. We will be auctioning of lots during our auction nights where the full funds from sold lots will go towards this fantastic venture. We will have special items to auction off at some regular meetings, such as signed Ad Konings cichlid books and items kindly donated by our sponsors to benefit this fund raising. We may even have special bake sales or competitions to support this in any way we can. We will be pushing awareness of the program and situation in Africa. This is a great way to help. The more people understand the situation, the more it can change and we can get help from all around Australia. We will be asking sponsors if they can help. As an example Aquotix will be donating 50 cents from each sale of AquaRealm Malawi salts and AquaRealm Tanganyika buffer products in their store. Some may donate items for auction towards the fund. You will see a tin at meetings near the kitchen with the below label on it. Please donate any change you can towards this important preservation fund. Every little bit helps. Who is Stuart M. Grant? This is what Ad Konings has to say about this great man. Stuart was born in England and during his childhood spent most of his school vacations in his grandmother’s house on the Isle of Wight, where his father was born. One of the simplest of Stuart’s pleasures was “cockling” off of Ryde beach when the tide went out. His impressions of this scene of his youth was so strong that he used the name the Romans gave to this island, Vectis, many times during his later life. Fortunately he was able, with his family, to revisit the island in 2005 when they stayed in the bread-and- breakfast establishment that used to be his grandmother’s house. Stuart joined the Royal Air Force in 1955, not as a pilot although he became one later in life, and was stationed at various places around the Mediterranean. At one point he drove a Volkswagen “Beetle” from the UK to South Africa and it was probably then that he became attracted to the Dark Continent. He worked for the British government in Nyasaland and later in the government of Malawi when it became an independent nation. In 1972 the government decided that Hennie and Peter Davies, the first cichlid exporters in Malawi, should have some competition and asked Stuart, whom they knew was interested in fish (killifish actually), whether he could establish a fish exporting business on the shore of Lake Malawi. Virtually without any starting capital Stuart took up residence at the Eagle Inn, a “rest house” (still in existence) on the shore opposite the Maleri islands, and started to collect fish, keeping them in net-covered drums in the lake. Stuart introduced the hookah-gear in Malawi so that his diver-collectors, instead of catching fish on a single breath of air, could remain underwater for any length of time, and considerably expanded the variety of cichlids exported. Later he changed his rest house abode for another, smaller dwelling: a tiny rented caravan at Kambiri Point but with the added feature of a sort of fish house on the property where he could, for the first time, keep the fish collected from the lake in vats. In the late 1970s he moved into a remodeled garage on the same property. Business picked up and he was able to purchase a small plane so that he could transport fishes and supplies between Likoma Island and Salima. By this time the Davies had left the country and Norman Edwards had taken over their license. At that time the lake was divided in three regions where three different operators could collect their fishes (to give each one a set of unique fishes that only they could provide). The third exporter was Eric Fleet, who operated from Blantyre. Although business was booming it wasn’t large enough for all three exporters and by 1985 Stuart was the sole survivor, operating from Kambiri Point. Suddenly there were more possibilities and he was able to purchase a 500 sq. m. plot next to his rented site. 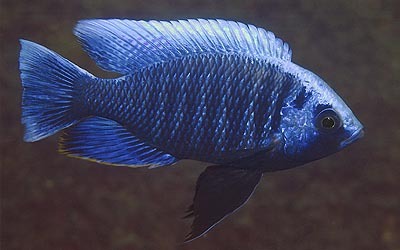 For more than a decade he was the only exporter of Malawi cichlids and introduced countless new species into the hobby. He established a, by African standards, very large operation at Kambiri with a main fish house holding hundreds of glass tanks, plastic containers, and concrete vats. Hundreds of large concrete vats were built under shade netting to hold cichlids that came from far away parts of the lake. He employed about 60 men and women who were responsible for collecting (six collecting teams were stationed around the lake), maintaining, packing, and exporting the cichlids. His impact on the local scene was enormous with up to 1500 people directly dependent on his fish exporting business. In the early 1980s Stuart started to invite hobbyists to his establishment and guided them on various trips on the lake. In 1986 he acquired a large diesel boat, the famous Lady Diana, which became an instant hit with visitors. From then on he employed boat builders who, over the years, built him many boats including five large, diesel-powered vessels. Today these boats are by far the best means of transportation on the lake and many aquarists have made dive tours on one of them. Stuart married late in life, at the age of 56, and his Malawian wife Esther bore him a daughter Louise and later a son, Justinian. 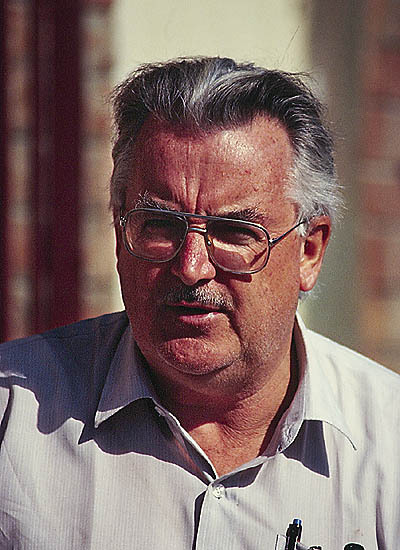 On October 11th 2007, at the age of 70, he died at his home, from heart failure. His funeral was attended by approximately 1500 mourners, an indication of his reputation in Malawi as well. He is buried on his land at Kambiri Point, overlooking the lake; the lake that he brought to us. He will be greatly missed by all who had the privilege of knowing him. For years it was thought that the huge biodiversity in Africa’s Rift lakes was in good shape and unlikely to be affected by the burgeoning human population; the simple reason being that no industry had established on the lakes’ shores. Industrial pollution and loss of habitat is the main cause of biodiversity loss around the world but the lack of an industrial-sized infrastructure in the countries around the lakes discouraged prospecting entrepreneurs from setting up camp. However, the paucity of jobs and income more or less forced the riparian communities to increase their fishing efforts. This massive increase naturally brought an enormous reduction in fish stocks. Since the early 1970s beach seines have systematically been employed by almost every village along the shores of Lake Malawi and by 1985 the number of nets had increased 50-fold and the fishing efforts even more, but the amount of landed fish had actually decreased. 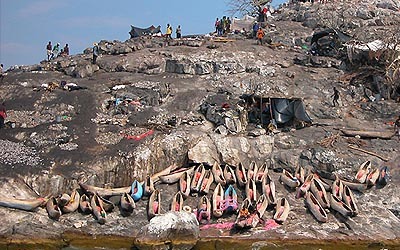 In the early 1990s fish stocks in the southeastern arm of the lake and those of Lake Malombe had collapsed. At present there is still no regulation in force even though beach seines and small-meshed gill nets are forbidden. When I visited the lake in the late 1980s beach seines were very prevalent and the catches, even strongly reduced from what they were 10 years earlier, were substantial. Nowadays beach seines are rare in the South East Arm of Lake Malawi, not because the authorities finally caught up with applying law, but simply because there are no fish left. The same is true for the Zambian section of Lake Tanganyika where beach seines are banned as well but the sand-dwelling cichlids of the shallow inshore waters never returned. In Lake Malawi I remember witnessing seines tied between two large diesel boats being dragged over long sandy stretches swiping several Lethrinops species into oblivion. Most of those operations have since long ceased because the fish are gone, but in the Salima Area seining is still very prevalent, with nets and ropes being laid 2 km into the lake. Unfortunately the area affected, the southwestern corner of the lake near Chipoka, is a major breeding area for chambo (Oreochromis spp. —tilapias) one of the main food fishes of Lake Malawi. These seine nets are employed during the breeding season of these fishes as they return to the area every year. Legislation is in place that prohibits fishing during the breeding period (Nov / Dec), but the controlling government body (Fisheries) does not have the means to enforce it. In 1980 the rocky shorelines and the islands around the Nankumba Peninsula in the southern part of the lake were declared National Park and in 1983 the park was elevated to a World Heritage Site. The park, the major part of which includes the forest reserve on Nankumba Peninsula, embraces lake waters that lie within 100 meters of the park’s terrestrial sections. Almost all shorelines within the park’s boundaries are rocky and the purpose of this arrangement is to include and protect as wide a variety as possible of cichlids, many of which are restricted to particular rocky shores. To date, a total of 220 species of rock-frequenting cichlids have been recognized within park waters. The total water area protected under the National Park is estimated at about 7 km2, a mere fraction of the lake’s overall surface area, but about 25% of the lake’s cichlid species are represented within. The lake and its multitude of fish species have been around long before our own species appeared on the scene, and although the lake is governed by the jurisdiction of three different countries, none of them can responsibly claim owning the lake and its treasures. Lake Malawi is a natural treasure of world-magnitude and it should be treated as such. The Malawi government has taken upon itself the difficult task of protecting a section, an important section, of this treasure for generations to come. Their mission is not simple and/or straightforward. Besides the preservation of the lake’s riches there is also the need to alleviate poverty of the people that presently live along its shores. 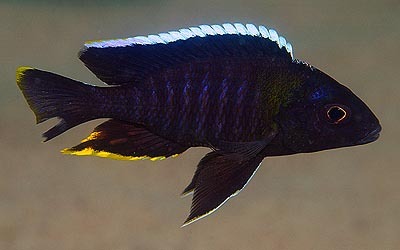 However, the cichlids of Lake Malawi National Park must never be exploited as a solution towards that predicament. Poorly-regulated and uncontrolled fishing is certainly a step in the wrong direction in preserving the lake’s viability but also controlled or sustained usage of resources in the park must be out of the question. The lake’s cichlid diversity is not a resource that can be measured or controlled. Conservation is the only option—indeed a difficult mission. Fishing in park waters is not allowed within 100 meter of the shore and although this was well conceived on paper, in reality the Park lacks the manpower to oversee these regulations. As a consequence fishing occurs in all park waters and in fact some places are so much over-fished that at present absolutely none of the many sand-dwelling or open water species, still present 10 years ago, can be found. It is also forbidden to set up camp or just to live on any of the islands included in the park, but hundreds of fishermen manage to dodge the law and permanently live in the Park. 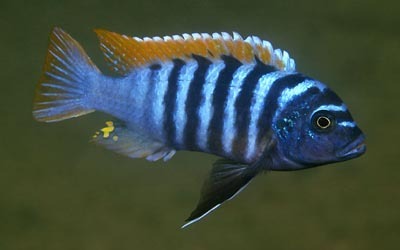 Since most of the sand-dwelling cichlids around these islands have been wiped out the fishing effort is now directed to catching the rock-dwelling mbuna. I have seen several small-meshed gill nets with hundreds of trapped mbuna right in front of Park headquarters at the southeastern tip of Thumbi West Island. Mbuna are also caught with so-called chirimila nets, originally intended for utaka but they have disappeared as well, around the islands where plankton blooms lure the mbuna away from rocks. This gruesome scenario was also in place around the Maleri islands where, over the years, beach seines had torn out the aquatic plants in the shallow sandy areas and left a bare sandy bottom void of any fish. Plankton-feeding mbuna were caught in chirimilas and trees on the island were cut for firewood for the numerous camps on the three islands. The islands were too far from Park headquarters at Otter Point (Cape Maclear) and the illegal fishing could thus continue virtually uncontrolled. The situation was grim all around the lake and the various tourist establishments had difficulty finding good spots for their guests to snorkel or dive and meet some of the awesome fish known to inhabit Lake Malawi. In 2006 a group of concerned Malawians were awarded a concession to “develop” the Maleri islands by establishing a camp on Nankoma Island, a lodge on Maleri Island, and a single cottage on Nakantenga Island. They had to build everything in agreement to the natural settings and where possible restore the original flora and fauna. There were also given “control” over the enforcement of the no-fishing zone around the islands and had to expel the illegal squatters. This group, called Waterlands, was initially funded by the Malawi Environmental Endowment Trust (MEET) as they understood that local control of the over-fishing situation would be more effective. Two main performers of this group, Nigel Cheal and Alan Pitman, set to develop and employ Anti Netting Devices (ANDs) that would hinder the illegal fishermen from pulling a net at any point in the no-fishing zone around the three islands. The first were set at the end of 2006 and after a few months had to be removed because too many bits of netting had accumulated around the device that it became ineffective catching additional nets. October 2007 more than 150 of these devices were protecting the cichlids around the Maleri islands. Most of these net-traps are suspended in the water by a thick steel cable attached to a very large anchor. 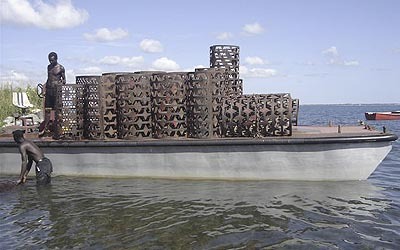 The anchor either consists of a large boulder or, in sandy areas, of a large drum-size cylinder (made up of old tobacco thresher baskets welded together to form a cylinder) that will be filled underwater with rocks and to which the floating trap is attached (see photo). Most of these contraptions were made and placed by Alan who has also started to plant the bare sandy areas with aquatic plants from parts of the island where they were still present. I remember that one particular corner along the eastside of the large island was heavily vegetated 20 years ago (underwater). All these plants have since been torn out by seine nets. Now they are slowly replaced by transplants from the surrounding areas. Illegal fishing is sometimes still a problem but these are with short static nets placed at risk between the artificial reefs. These aquatic plants play a very important role in the lives of many utaka as they serve as nursery grounds giving protection and food to the small fry. The local fishermen, who are allowed to fish beyond the 100 meter boundary of the Park, commented recently that there seems to be more fish around the islands. 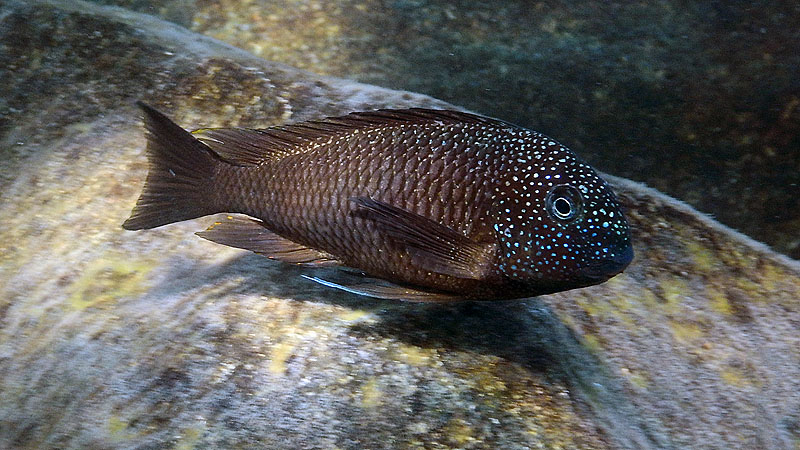 Also the tour operators of Danforth Yachting commented that the rock-dwelling cichlid populations around the Maleri islands are in a much better shape than those at Cape Maclear and they now prefer to bring their guests to the Maleris for snorkeling and/or diving excursions. I have always been of the opinion that you can only protect a natural resource by buying the habitat in question, put a fence around it and limit access to those that want to enjoy and shoot with cameras. It is impossible to do so with Lake Malawi and although there have been talks of turning the entire lake into a multinational park, preventing over-fishing in select areas really has a chance of succeeding in preserving the great biodiversity still to be found in this magnificent lake. Clubs like the Babes In The Cichlid Hobby, Minnesota Aquarium Society, and the Missouri Aquarium Society, Inc. (photo) have already gathered funds for the Malawi cichlids conservation. Ask your club if they can donate or organize an auction for the Stuart Grant Fund. Cichlid Press can help donate books for an auction (clubs can send requests to Cichlid Press, PO Box 13608, El Paso, TX 79913). Thanks to all the hobbyists and associations that have already donated to the Malawi cause! Enjoy your cichlids! Latest progress updates from Ad Konings - April 2015. 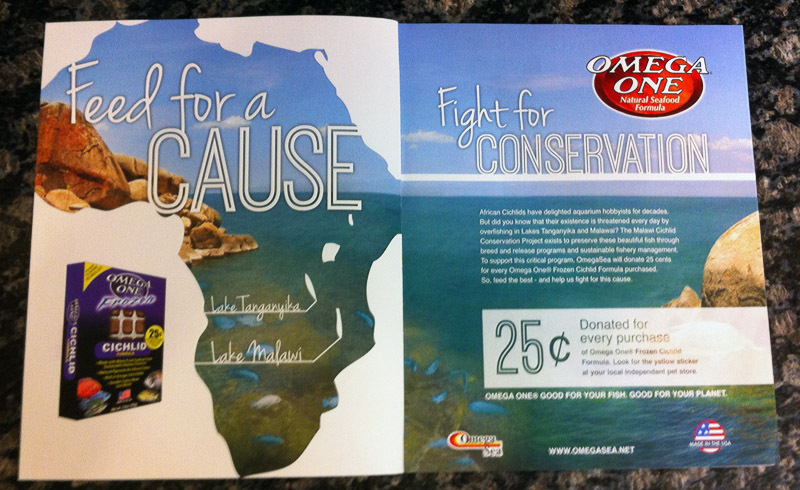 As some of you may have seen in the TFH magazine inside front cover March issue, Omega One has now joined our fight in conserving Malawi cichlids by donating to the Fund 25¢ of each package Frozen Cichlid Formula sold!! I’m very grateful to Kelly Randall, the marketing director of Omega Sea, for pursuing this project. So, please, check the frozen food section in your local pet store and help us all preserving Malawi cichlids in their natural habitat! 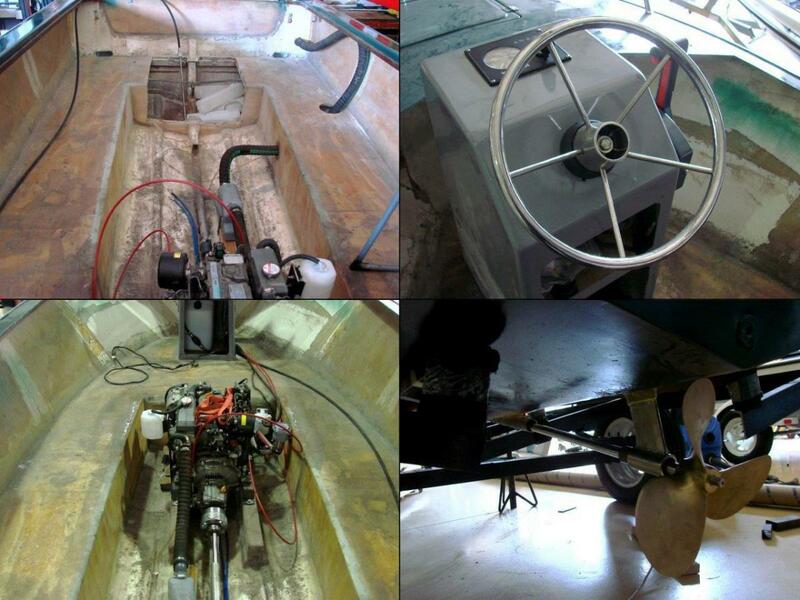 Last December the Fund transferred $13,465, most of what we had in our coffers, to finance the new boat for the guards and for the fitting of the diesel engine. They subsequently encountered some problems with the fitting and needed outside advice on how to proceed. This has now been solved (hopefully) and they are now back working on it with an anticipated completion 6-8 weeks from now. I have not yet received any update on the placing of demarcation buoys around the Maleri islands, but Dimitri tells me that Matt is very committed to all conservation efforts and is keeping the National Parks patrols up every month. We will have more from him in the next update. Another bit of good news from Malawi is that Larry Johnson is again going to release P. saulosi at Taiwanee Reef with a group of visitors later this year. At the same time they will make a rough inventory of this species at the reef. 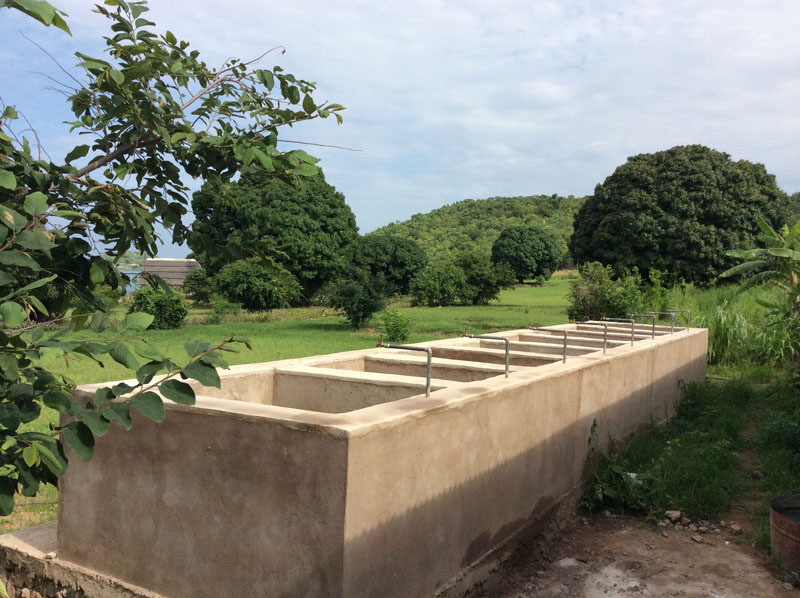 The breeding station setup in Kipili, Tanzania, at the Lakeshore Lodge is taking shape and Chris Horsfall hopes to have water running in the vats in June when I’ll be there. I have attached a photo of the completed vats that Chris sent me about a month ago. In the meantime he has obtained a solar pump in Dar es Salaam and is currently fitting the pipes and tubes. That is the good news; the bad news is that a German exporter has by now about extirpated the Tanzania Murago Tropheus, one of the species we were hoping to breed in Kipili. I’m planning to visit the site in June and will report on the situation. In the meantime Chris and Louise presented their project of breeding endangered Tanganyika species at a Great Lakes 2 Great Lakes conference in Kigoma last February and impressed the head of Fisheries Development in Tanzania, Hosea Gonza Mbilinyi, so that he issued a statement that the four species they are planning to breed are now officially off limits for exportation. These four species are: Tropheus duboisi “Maswa”, Tropheus moorii “Tanzania Murago”, Ophthalmotilapia boops “Blue Neon”, and Petrochromis sp. ‘red’. We all know that it is not that easy to control exports of fish but at least they managed to get the Tanzanian government on our side regarding conservation. A big THANK YOU to Chris and Louise! Thank you ALL for your concern for the cichlids’ future! Enjoy your cichlids! Well done to the PCS Committee for doing this. An excellent idea and cause worthy of the PCS getting behind. Fish Antics said it all really, great job guys!!!! Good news from Mr. Ad ! You may have heard through the grapevine that the so-called Tanzania Murago is still around in the lake. A few friends and I visited the site last July and although the population has suffered visibly, the species is still there. I estimate that about 50% of the population has been removed and, interestingly, the fish from adjoining areas did not (yet?) occupy the empty space from where the Tropheus was caught. So snorkelers swimming in one direction didn’t see a single individual while those in the opposite direction started to find them in seemingly normal numbers. We were all relieved. Let’s hope that those aquarists keeping this form breed them in sufficient quantities so that we don’t need to rely on the natural population. 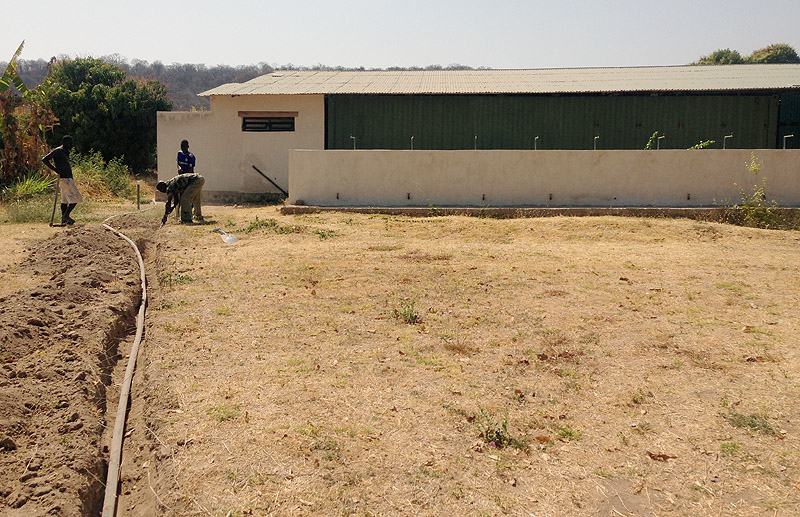 The breeding station setup at the Lakeshore Lodge in Kipili is progressing. Chris had been waiting for a compound to put on the inside of the vats to seal them, which he has applied in the meantime. Last week he and his staff dug a 500-foot-long trench from the lake to near the vats to hold the water intake line from the solar pump at one end, to a 5000-liter container on the other. Omega One has already contributed to the Fund through the sale of their Frozen Cichlid Formula—Thank you!—and Kelly Randall, the marketing director of Omega Sea, has also sent a box with Super Kelp Flakes to Kipili as food for the breeders. Great! 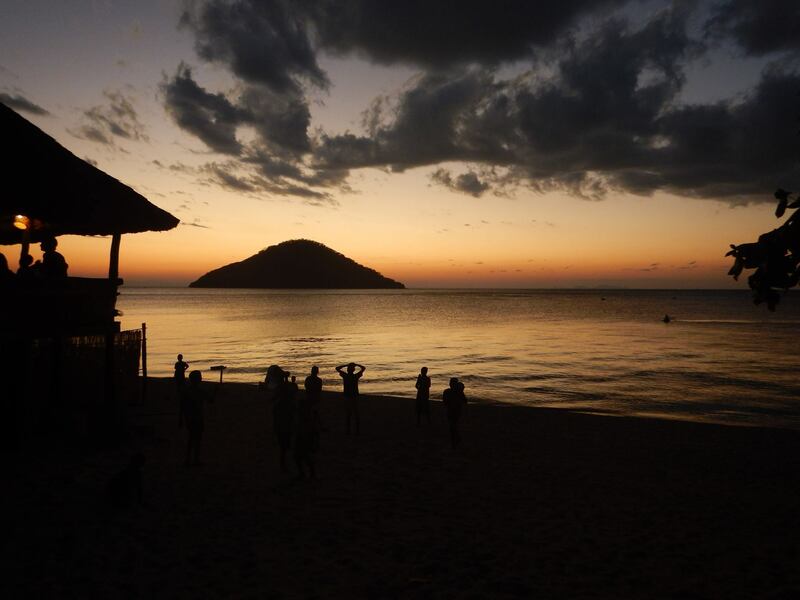 We have also news from Matt, manager of the Blue Zebra Lodge on the Maleri Islands in Malawi. He anticipates more pressure on the fishing around the islands because of the poor rainy season leaving the lake almost two feet lower compared to last year and thus affecting crop yields. Matt also supplied a list of illegal activities recorded on and around the Maleri Islands and found that they are in better control of the illegal fishing. He credits the improving numbers to three factors: 1. Change in the routine patrol, 2. increased availability of resources, and 3. higher penalties charged to offenders. Matt thinks that the recorded improvements are due to better prevention (several patrols per month) and also to better dialog with the communities. As an example of the latter he mentions that the local (Maganga Village) soccer team, which is sponsored by the lodge, changed their name from “Fisherman Club” to “Blue Zebra Club”. Nevertheless, Matt remarks, their efforts are not totally persuasive. Every week, he still removes long fishing lines from the no-fishing zone at Nakantenga Island, and six of the ten demarcation floaters he installed last year have gone missing.... Thank you very much for your report, Matt! 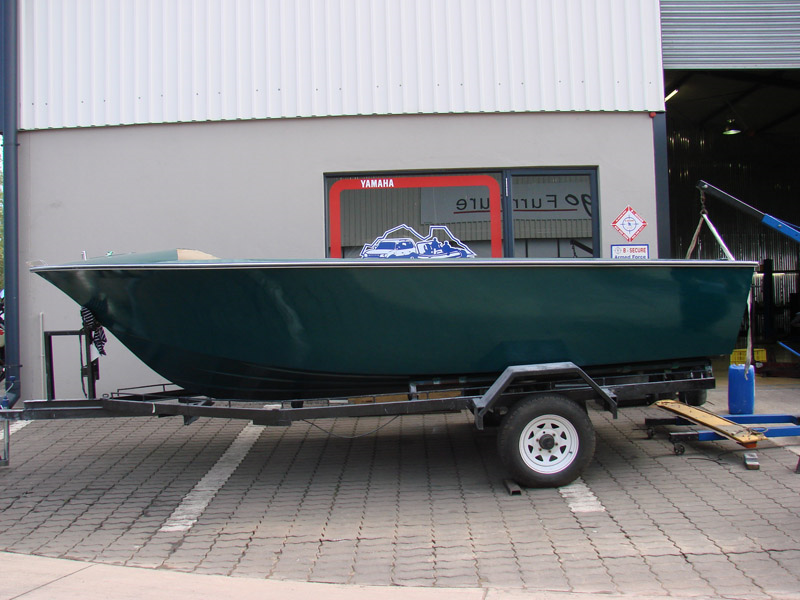 There is some progress on the guard’s boat that is being fitted in South Africa. The hull has now been prepared to receive the customized diesel engine and Dimitri hopes the boat will be operational before the end of the year. The Fund recently received a big infusion from the Babes In The Cichlid Hobby; a whopping $4,500!! With the help of many donors who supplied them with numerous cichlids and fish-related goods, they auctioned and auctioned during the Springfield ACA convention this summer. Thank you so much, ladies! A good chunk of the donation went straight to Tanzania to assist Chris and Louise in completing the breeding station. I would also like to thank Mikael and Magnus Karlsson, the discoverers of the Tanzania Murago (among many other fish), who donated the stipend for their article in Cichlid News to the Fund. Good job on PCS and members as we raised already $512.00 for the Fund!!! All the donations will be sent out either when we reach $2000 or at the end of the year. Anybody who has got a shop/store, even not fish related at all, and is happy to put a donation tin on the counter for the Stuart Grant Cichlid fund.... well, just ask and we will provide you a nice-custom made- Cichlid fundraising tin!!! Great update Mattia. Sponsors or stores we also have laminated promotional A3 posters. Let's make a difference to the hobby folks.. get on board! I love reading all this, all you guys donating like this are truly amazing shows you all really care for the hobby! Keep up the good work guys! Yes I'm young, but I'm smarter than you think! Great job guys. Wish more people would get on board. Even if it's only $5, it's still something. Just heard that Larry Johnson and his group released around 60 Pseudo. saulosi (some adult size) on Taiwanii Reef in Lake Malawi on 17th September. This is the third release of lake-side bred fish as part of the program funded by the Stuart M Grant Conservation Fund, aimed at re-establishing these fish in the lake. 32 salousi were released in 2014, and a further 90 last year. Edited by humbug, 20 September 2015 - 01:22 PM. Larry Johnson just returned from Malawi where he and his group again released about 60 P. saulosi at Taiwanee Reef.Thank you David and your team at Stuart Grant Ltd. for breeding these!! As usual they did a short swim around and count all the P. saulosi they saw before the new fish were released. In 2013 we counted on average about 40 individuals during a 15 minute survey, and in 2014 Larry counted about 55. This year Larry and Pete Barnes counted about 175 in a 10 minute survey!!! The other divers soon lost count as there were several groups of 15-30 individuals! Even though this is fantastic news, P. saulosi is far from being recovered completely. One of the safari participants, Chris D’Amour, sent me some footage of Taiwanee Reef videoed while he swam around. On it there are still very few P. saulosi and the huge schools that used to cover the upper rocks 25 years ago appear to not have recovered as of yet. But everything looks like that they will as long as we abandon collecting the population. I want to thank Larry and his friends for releasing the P. saulosi for the third time, and also everyone who refrained from buying wildcaughts or asked wholesalers to import some. The video shows the release of the P. saulosi and was again shot by Peter Barnes. Thank you again, Pete! There has been a lot going on since Matt sent you the update. Well... it seems that the conservation fund is already working! Yay! PCS will give an update on how much we have for donations after the auction, remember that 20% of all the sales will be donated to the fund, plus 20% of the raffle table tickets money and 20% of the kitchen sales too. Thanks for your kind donations guys, this is real and happening right now! I might not seem much, but even a single dollar makes a big difference. A piece of airline, an airstone, a packet of food... things that are obvious for us, aren't so easy to get in Africa. Small video of the last release of P. Saulosi at Taiwanee Reef, thanks Larry Johnson and everybody who's putting effort and donating a bit to make this magic happen ! Edited by Jason82, 19 October 2015 - 12:07 PM. Thanks to all your great help and donation, thanks to the Sponsors participating to the fund raise, thanks to the committee involving and spending all their time on it, and thanks to everyone who donated any dollar towards this, I'm happy to announce that last night we finally sent all the donations collected in these 3 months to the Stuart Grant Fund! We raised AU$1756.00 in about 3 months!!! That is way more than what we expected when we decided to start this program. THANK YOU ALL so much for this spectacular donation to the Stuart Grant Fund!! I have attached a pdf file with the certificate of donation which you can display on your website or print out, or just see it as a thank-you note. Thank you, Mattia for being the coordinator of this huge effort! It is heartwarming to see hobbyists involved and care for the fish in the wild. For the people that weren't at the last meeting and don't know, I received 3 more Celebrating Cichlids books from Ad, and 1 of the latest released book Cichlids of the Malawi National park, all in glossy paper!! All the books will be auctioned off at the next meetings, so be prepared to gram them! The fundraising program will keep going of course, this is probably one of the best fund raising program that a Cichlid club could get into in my opinion! Yes, there's some cool updates that I'll explain at the May auction! Are you going to be there bud?